An honour roll commemorates those who served in World War One. It lists 50 names. 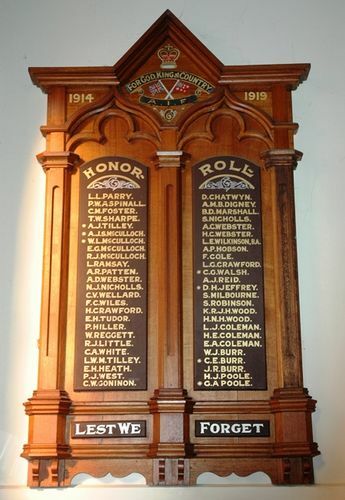 At the Methodist Church on Sunday night a roll of honour, containing the names of members of the church who had gone to the front, was unveiled by Mr. C. Ramsay, who spoke in terms suitable to the occasion. The church was packed to the doors. Rev. H. Wilkinson gave a stirring address, making an appeal to the young men to offer their services to their country. Referring to the action of the Federal Parliament in regard to the Referendum Bill, the speaker said this was not the time to stir up party strife. A politician who would not lay it aside to further the active prosecution of the war was committing a criminal offence. Examiner (Launceston), 12th July 1915.